You've read Paul Tobin and PJ Holden's first Gunsuits adventure, starring Cassandra 'Potts' Potter and thousands of universes. Now learn the origin of the war she was fighting: a very different reality, where Lieutenant Reegan Alexis is compromised in battle against a bio-mech until Walter Rice puts her back together - with a few extra enhancements! 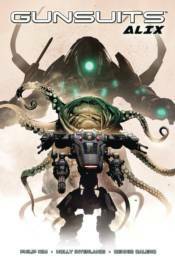 It's Lovecraft meets Robotech in this special oversized 'zero issue'!